George Long can't hide his disappointment as former Sheffield United team mate Lyle Taylor scores on Saturday. 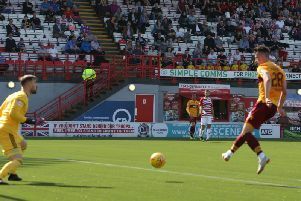 Motherwell goalkeeper George Long hates when he concedes goals especially when they are scored by a former team mate. Long and Partick Thistle’s Lyle Taylor were together at Sheffield United and it was the striker who got the upper hand on Saturday, grabbing a brace in the Firhill side’s 2-0 win, with his first - a free header at the back post - particularly vexing the ’keeper. He said: “We’ve been solid of late and the defence in front of me has been brilliant since I got here so we’ll work in training and ensure that things like the opposition getting a free header at the back post doesn’t happen again. The defeat to Patrick leaves ’Well six points off Ross County in the play-off zone, but Long is confident they can still get to safety in the five post-split fixtures. He said: “We were solid first half at Firhill, creating chances, and then took our foot off the gas for whatever reason and they made us pay. “It’s really frustrating, but we have five massive games coming up, which are all winnable, so it is still in our hands and we’re just looking positively towards them. “Who knows what can happen, depending on other results we may need to win all five games, but looking at this team we have scored four and five goals in our last two home games so we have the quality in the squad.